I think I might be a little into the whole waffle maker idea having recently finished all six seasons of Gossip Girl for the second time. But I stand by it! It’s a lovely gift, very cute if your mum likes the whole retro theme and perfectly (and a little selfishly) welcomes the world of wonderful and quick breakfasts every morning. I saw this and thought it was a super cute idea. Of course, you can hand make these yourself if you’re feeling a little craft-y. There’s nothing quite like giving a personalized gift and this is personal above all personal. It does require some time and thought. But if words come to you easily then this would be a wonderful option as a Mothers Day gift. A little cheesy, yes. But isn’t it adorable? Plus, it serves as a perfect reminder as well as being a lovely decor piece. The colours are very spring-like too so its perfect for injecting some fresh colour into a living space. So I guess a multi purpose gift. I reviewed this fragrance a while back. I go on and on about how much a love this scent in that post but as a brief summary – it’s wonderfully floral (as the name would suggest) and feels very luxurious to wear. Again, it’s perfect for spring yet still strong and womanly. 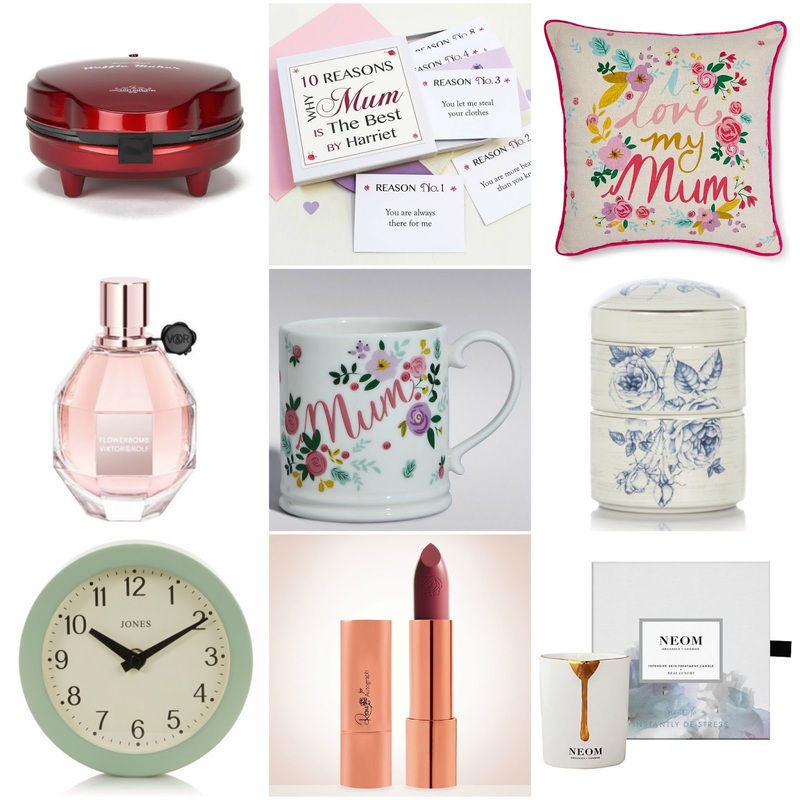 Pricey but really great if you want to give your mum an extra special treat this year. This sort of matches the cushion so if you wanted, you could buy both together as a gift. I think this one works well on its own as well though – maybe fill it up with some homemade treats (like fudge or truffles) in a cellophane bag tied with a ribbon for an extra somethin’-somethin’. This is the most affordable option I’ve got in my gift guide and honestly, I think it’s one of the best. I found this little gem in ASDA and it’s just so adorable! Perfect if your mum owns lots of little trinkets or needs something for her favourite pieces of jewellery. The pattern is very vintage and is quite practical with it’s stacking feature too. Another ASDA find. Clocks are often overlooked, but I think they can make or break a room. This one is another perfect transition into spring with it’s pastel rim. Very simple and chic. Not to mention extremely wallet friendly. They have this design in other colours too (including copper if you’re interested). This is a new range from M&S which I am desperate to try. The lipsticks look absolutely incredible and have amazing reviews. The packaging just screams luxe. A couple of these wrapped in tissue paper in a gift bag would be a wonderful gift option for a mum. Maybe a blusher or powder too if you’re feeling spendy. Last but not least, another slightly pricier gift. But this is just beautiful. I almost would keep this one for myself. Neom candles are known for their quality but the packaging of this one makes it stand out. It would be a wonderful jar to clean out once the wax is burnt and use as a brush holder. I can’t think of a mum (or any woman for that matter) who wouldn’t love to receive this. Let me know what you think of this gift guide. I really hope it helps inspire you for what you might get!